Our medical team has extensive experience in the translation of medical equipment user manuals, patient information sheets, product characteristics and clinical trial documents and is more than happy to take on anything else you might want to challenge us with. 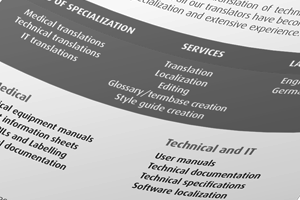 Our technical and IT translation team can help you with anything from standard user manuals of home appliances, industrial equipment or heavy machinery to more complicated technical documentation or software localization. If you’re interested in any of our services or have any further questions about our fields of expertise or experience, just contact one of our project managers! We recommend this package for highly visible texts with extreme demand on accuracy, e.g. medical content, where even the tiniest mistake can have great consequences. This is perfect for anyone who goes by the motto of “better safe than sorry” as three pairs of eyes help to ensure that no mistakes slip into the text at any given phase. We recommend this package for highly visible texts, e.g. 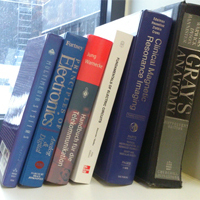 for medical and technical content, where accuracy and good style are of the utmost importance. Teamwork between the translator and the reviewer ensures that the translated text is terminologically correct, all spelling mistakes are eliminated and style is consistent throughout the text. We recommend this package for texts that serve informational purposes only, e.g. if you are only interested in getting your point across and the content will be used temporarily. We do not recommend this for texts that will be published or printed as the translation does not go through review where stylistic errors and spelling mistakes are eliminated. Quality is not an added value for us, good quality is a given. In our everyday work we act according to the European quality standard EN 15038:2006. At Grata we understand that a well-localized text plays a big part in the success of any product or enterprise. In order to make sure that our translations are as fluent as possible, all our translators translate only into their native language. Every text is assigned to a professional native speaker who has proficient knowledge of the given subject matter, and is later edited by a staff editor well-versed in the grammar and orthography of the target language. This process helps us to ensure that the translated end-product is up to bar both terminologically as well as linguistically. Since 2012 Grata is also a member of the Association of Estonian Translation Companies, which was founded in 2000 in order to organize the Estonian translation market and unite reliable and responsible translation companies that are focused on quality. Since 2004 the AETC is also a member of the European Union of Associations of Translation Companies. 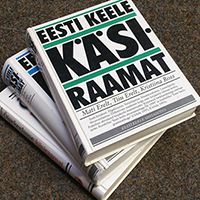 Cooperation with the AETC allows us to contribute to the development of translation services in Estonia to uphold the quality of translations on the local market. Exchange of information and best practices with the biggest translation companies in Estonia helps us to make sure that our quality and means are always up to date and we can keep our finger on the pulse of the latest changes on the translation market. We make use of the best translation and project management programs on the market in order to optimize our work and thus ensure the best quality. XTRF™ System is one of the most popular platforms among professional translators for translation project management and optimization. We use this software in our everyday work to process jobs, find the best-matched translators, communicate all necessary information and manage invoicing processes. A number of our clients have also developed their own CAT-tools and we have successfully incorporated these into our everyday work as well. We are always open to adopting any client-specific translation tools to accommodate all the needs of each and every single client. Quality assurance tools help us to carry out final checks to eliminate all possible inconsistencies, tag errors and spelling mistakes. In our everyday work we make use of such QA tools as apSIC Xbench, QA Distiller, Y-Snell, etc. In 2016 Grata began cooperation with the Institute of Computer Science of the University of Tartu to develop a customized and subject field specific machine translation engine, using Grata’s own databases and translation memories as the basis, for translating technical texts from English and German into Estonian. Enterprise Estonia financed the project from the European Regional Development Fund. Grata believes that in order to start providing proper post-editing services for Estonian in the future, it is necessary to cooperate with translation specialists as well as technical experts to develop a translation engine that has been optimized and customized according to the needs, language pairs and specialization of the translation agency. Translation agencies cannot use widely spread and generic translation engines as this would result in quality problems and confidentiality breaches. Grata’s technical MT engine was completed at the end of 2018 and since 2019 we have slowly started to integrate it into our workflow. A reliable translation engine increases the translation speed of certain types of texts, specifically of technical nature, which means bigger volumes with shorter deadlines and for a better price for the client and higher productivity for the translation agency. It does not affect the editing/proofreading and quality assurance processes. To find out what could be in it for you as a client, contact one of our Project Managers!